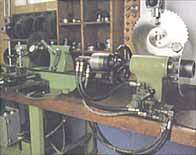 Klingelhofer Corporation has supplied the metal sawing industry with the finest circular saw blades for over 70 years. 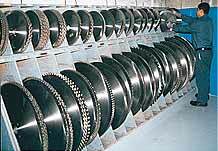 We carry the largest stock of segmental saw blades in the country. In most cases, your order will be processed and shipped the day we receive it. A partial view of our large inventory of solid H.S.S. saw blades. 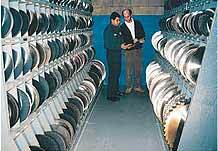 We can supply circular steel saw blades for most makes and models of cold saws. Special bores and drivepin holes are no problem. Our solid H.S.S. 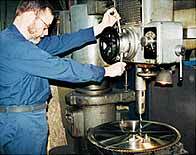 saw blades are tested to assure proper side clearance, minimum side runout, and correct tooth geometry.